Jason Cummings was the hero for Hibernian as the Easter Road side began life without Scott Allan. The striker came off the bench to give the hosts their first Championship win of the season, converting a cross from David Gray on 58 minutes. Liam Fontaine nodded over a good early chance for the hosts and Gray had a header well saved by Derek Gaston. Morton's best chance fell to Stefan McCluskey but he could not beat home keeper Mark Oxley when one-on-one. With midfielder Allan joining Celtic on Friday, Liam Henderson was among the home substitutes after arriving on loan as part of the deal. And the teenager did well to set up a shooting chance for Lewis Stevenson late in the game, although the full-back could not hit the target. Stevenson had done better earlier on, crossing for Cummings to head straight at Gaston shortly after scoring. The hosts were in command for long spells and would not regret those missed opportunities as they picked up three points. Match ends, Hibernian 1, Morton 0. Second Half ends, Hibernian 1, Morton 0. Attempt saved. Samuel Stanton (Hibernian) left footed shot from long range on the right is saved in the centre of the goal. Attempt missed. Dylan Stevenson (Morton) right footed shot from outside the box is too high. Attempt missed. 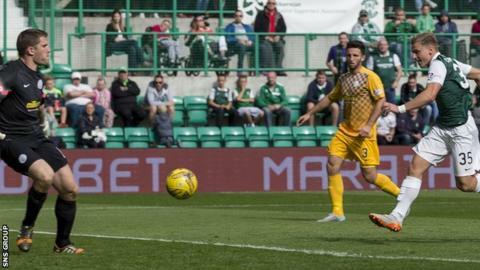 Lewis Stevenson (Hibernian) left footed shot from outside the box misses to the right. Substitution, Hibernian. Samuel Stanton replaces Martin Boyle. Delay in match Ricki Lamie (Morton) because of an injury. Foul by Peter MacDonald (Morton). Substitution, Morton. Romario Sabajo replaces Stefan McCluskey. Michael Miller (Morton) wins a free kick in the attacking half. Substitution, Morton. Dylan Stevenson replaces Mark Russell. Substitution, Morton. Bobby Barr replaces Ross Forbes. Corner, Hibernian. Conceded by Michael Miller. Attempt missed. Jason Cummings (Hibernian) left footed shot from outside the box is too high. Substitution, Hibernian. Liam Henderson replaces Daniel Carmichael. Attempt missed. Denny Johnstone (Morton) right footed shot from the centre of the box is too high. Attempt missed. Peter MacDonald (Morton) right footed shot from outside the box misses to the right. Attempt missed. Liam Fontaine (Hibernian) header from the left side of the six yard box is close, but misses to the left. Attempt missed. Stefan McCluskey (Morton) right footed shot from the centre of the box is too high. Attempt saved. Jason Cummings (Hibernian) header from very close range is saved in the bottom right corner. Goal! Hibernian 1, Morton 0. Jason Cummings (Hibernian) left footed shot from the centre of the box to the centre of the goal. Assisted by David Gray with a cross. Substitution, Hibernian. Jason Cummings replaces Marvyn Bartley.